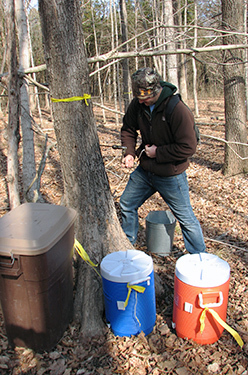 Interested in making your own maple syrup? Come and join us for this beginner’s maple syrup class. You will learn how to tap a tree, what tools to use, and how to keep production cost down. Designed for adults only. Registration ends January 21 at 8 a.m. Please wear walking shoes. Part/all of this class takes place outside. Please dress for the weather. You will learn how to tap a tree, what tools to use, and how to keep production cost down. Class- Carriage House at Shaw Nature Reserve. Come prepared for a short walk.